Some hardy Seattle Urban Sketchers and Seattle Plein Air group braved the weather to get together (briefly) on the 13th to sketch/paint in the International District. We met at covered tables outside Starbucks (just west of Uwajimaya, where this is drawn from). I got down there early and started a larger sketch (from the children's park) on watercolor paper, but it will take a few more visits to finish. The weather was wet and sort of cold, not a great day for sketching. We all decided we wouldn't try and get back together in the afternoon but would post what we had done on the sketcher's site. After giving up on the weather I headed to SAM for some indoor sketching. 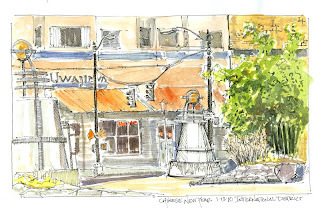 it's too bad the weather didn't help, Uwajimaya is a Seattle landmark, glad we have it now in the blog thanks to your sketch!